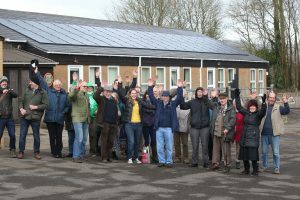 Dorset Community Energy (DCE) is a not-for-profit Community Benefit Society, registered with the Financial Conduct Authority, which facilitates community ownership of renewable energy production. The Society was established in 2013 with support from the BIG Lottery-funded ‘Communities Living Sustainably in Dorset’ project. It has 152 members and is managed by a board of Non-Executive Directors. These members have invested £490,000 in DCE, which has financed the installation of solar photovoltaic panels on twelve schools and four community buildings in Dorset; the total installed capacity is 420 kW. Electricity is provided to the community buildings at zero or low cost, any electricity not used on site is exported to the national electricity grid. Revenue is generated from the sale of electricity and from the government’s feed-in-tariff. The income covers the operational cost of the Society and provides a return on investment to member shareholders.